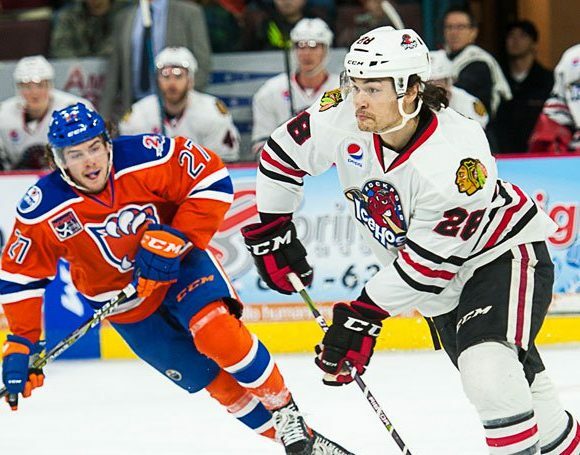 The Rockford IceHogs managed to split two home games this weekend despite goals being at a premium. 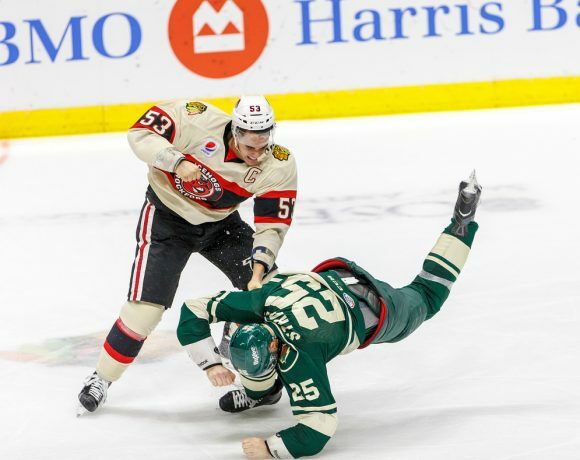 Chicago’s AHL affiliate disappointed the BMO Harris Bank Center fans by being shut out Saturday night at the hands of the Milwaukee Admirals. They rebounded the next afternoon, rallying in the third period to force overtime against San Antonio, then grabbing the third point in extra time. The IceHogs (10-9-1-4) are in sixth place in the AHL’s Central Division with a .521 points percentage. Rockford is nipping at the heels of Chicago and Texas for the fourth-place slot in the standings. The fans were miffed Saturday because they had brought stuffed animals with them to throw to the ice. It was the team’s annual Teddy Bear Toss Night and a bevy of fluffy friends would cascade to the playing surface upon the first Rockford goal. One problem; there was no first Rockford goal. Through forty minutes, the only scoring came on the Admirals side of the score sheet. Following the second period buzzer, fans headed out to the concession stand, restrooms or whatever place they go to avoid being hit with foam rubber hockey pucks. The IceHogs would score in the third and bring down the bears…or they wouldn’t and the promotion would simply take place at the game’s conclusion, as it has in other years in which Rockford was shut out. Immediately after the Hogs chuck-a-puck promotion, it was suddenly announced that the fans should start throwing bears onto the ice. This caught a good portion of the audience off guard to say the least. Perhaps management was hoping to avoid renegade fans throwing stuffed animals during live action, as happened a few seasons ago. Maybe they wanted to avoid halting a possible momentum burst when the Hogs got back into the contest with a third period goal. It’s possible that they looked at Rockford’s offensive production of late and decided that a shutout was inevitable. Select the option that best fits your personal narrative. The piglets were indeed blanked in the final twenty minutes. The disgruntled fans who missed the impromptu toss hurled their bears at the game’s unfortunate conclusion and went on with their lives. There was a bit of egg on the face of the organization in the aftermath of the promotion. The IceHogs twitter account hinted at the change as the second period was beginning to wind down, but a live announcement that would have surely kept the bear-bearing butts in the seats through the second intermission never happened. The affair was bungled; however, all’s well that ends well. The bears were still donated and will be put to good use, and the IceHogs…well, the IceHogs got shut out. But they won the next day. And they’re getting a little healthier. Terry Broadhurst was back in the lineup this weekend after missing from action since November 7. Goalie Collin Delia missed the weekend, but Hogs coach Derek King said that he’d be returning to full practice this week. Ads goalie Tom McCollum sent away all 28 Rockford shots to put a damper on the Hogs annual Teddy Bear Toss. With this win, Milwaukee also evened up the season series between the two teams. Most of Friday’s scoring came in the last five minutes of the opening period. Connor Brickley crashed the IceHogs net and got a rebound past Rockford starter Anton Forsberg at 15:06 of the first. A few minutes later, Alexandre Carrier knocked in a loose puck in the Rockford crease. The Hogs trailed 2-0 after 20 minutes and never really got back into the contest. Rockford’s best chance to cue the Teddy Bears came during a busy second period. 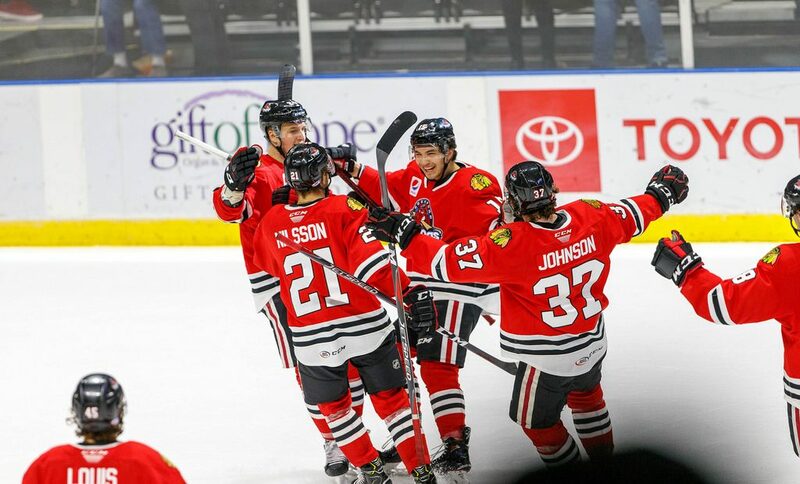 The IceHogs had a power play opportunity and out shot Milwaukee 13-4. Unfortunately, nothing found its way past McCollun. The Admirals defense stifled Rockford in the final frame and Milwaukee got an empty netter in the final minutes. The IceHogs scraped together enough offense to rally in the third period and triumph in Gus Macker Time. It took nearly 25 minutes, but Rockford cued the horn for the first time all weekend on a Jacob Nilsson tally. Nilsson parked in the slot to redirect a shot from Carl Dahlstrom past Rampage goalie Ville Husso, off the post and into the net. Luke Johnson brought the puck into the San Antonio zone and collected a rebound of his own shot to set up the scoring play. Rockford was out to a 1-0 lead at 4:56 of the second period. San Antonio took a 2-1 lead with a pair of goals in the first 4:21 of the third. The Hogs squared things up at the 13:11 mark with a Graham Knott slapper from the right point. Nathan Noel dug a puck out of the left corner and brought it around to Dennis Gilbert, who fed Knott for the equalizer. Hogs goalie Kevin Lankinen stopped 35 of 37 shots in regulation. The rookie saved his team’s bacon in the extra session with a pad save to deny a 2-on-0 rush by San Antonio. The overtime period was entering the final minute when Nilsson found Dylan Sikura knocking on Husso’s back door. The pass was true and Sikura The Younger guided it into the promised land for the game-winner. Rockford has a full week of practice before another pair of games at the BMO. The Hogs take on the hot Grand Rapids Griffins on Friday before bringing in the Chicago Wolves Saturday. Follow me @JonFromi on twitter for thoughts on the IceHogs all season long.